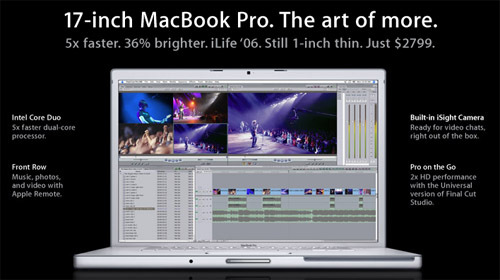 The folks at Apple wanted to let us know the new MacBook Pro is “The art of more.” More features! More speed! More brightness! More! More! More! But the folks at 37signals keep telling us that “less is better.” Less features! Less options! Less! Less! Less! So who do we believe? Are they of two different worlds? Actually, I think both companies strive for simplicity in their systems. While no one wants to think of buying “less” computer (we always want bigger, faster, more in hardware, don’t we?) people do like simplicity in their software. Both Apple and 37signals try to offer simple, easy to use software, and I think they’re both succeeding in that area. Posted on Monday, May 1st, 2006 at 8:30 am. Subscribe to the comments feed. Both comments and pings are currently closed. Post on your own blog. Apple strives for simplicity with software too. They’ve eliminated acessories that would distract from simplicity, such as the modem or external monitor cables. One could argue in some of its models it intentionally curbs their features to simplify the choices for market consumers. When certain features are missing that only a video professional would use on the lower models, it becomes obvious only the better equiped models are best. I’ve read that Apple puts as much thought into what features to leave out of a product as to what features a product should have.